The one common thing in Passover between the Seder and the vacation starting the day after is this. The point of the Seder is being with family and friends and apparently the vacation time in Passover is the same, big time. The Passover vacation (anywhere you go) is with the rest of the "family", the country that is. There isn't a place "passed over" by the Israeli people, no where un-found, no rock un-turned. Even European countries find themselves talking Hebrew this time of year, to each other. But I am not complaining, we have amazing weather, beautiful beaches and great food. 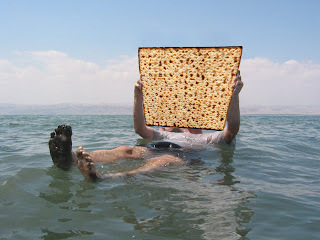 Well at least for those of us who don't keep a Kosher Passover (not eating bread only maza) like us.